become a group of blinking fireflies at night. These little insects are each filled with a blinking LED light. The base houses a solar panel so that the light of the day can be stored in the included rechargeable battery. When darkness falls the unit automatically lights up and the small bugs begin blinking their internal lights. The lights should last up to 10 hours at a time and the battery should be good for 2 years. 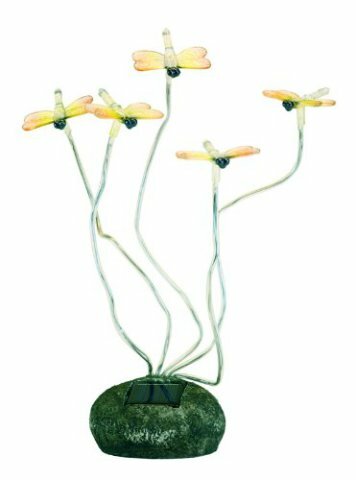 To order this adorable Garden Dragonflies Solar Lights decoration for your garden or patio, click here.